Having been inspired to review my miniature of Auchentoshan 18 by @Markjedi1, it was suggested to me that I try the Valinch. Sadly, it is no longer available, but @Astroke came to the rescue (twice now – the first time as a vital link in the delivery chain of a now unavailable bottle from Nova Scotia) with a sample of the 2011 expression, which I review for you now. I kind-of regret not discovering Auchentoshan earlier in my whisky career, when some of these expressions were less expensive and more readily available. I’ll definitely be looking to try other versions when I come across them in the future. Thanks to @Markjedi1 and @Astroke for helping to broaden my horizons. I'm glad you got the opportunity to try this! Next morning the empty glass smells distinctly of butterscotch. I loved this vanilla-rich pound cake, even though I just had a little bit of it in a specialized whisky bar. NOSE: very delicate, rounded vanilla with some hints of oak. Water releases more honey and floral aromas, candied citrus peel, pound cake, walnuts, shortbread, whipped cream with vanilla. With even more water it releases more grassy notes as well. TASTE: incredibly rich, full-bodied and very sour. The sourest whisky I've ever tried. But this sourness is in a very good balance with sweetness. Dried sugary lemon, caramel, vanilla, creme brulee and black pepper. FINISH: creamy and long with hints of vanilla and shortcrust pastry. OVERALL IMPRESSION: this is definitely a big dessert of a whisky. Being at cask strength, it can take a lot of water and thus you can savor it that much longer. Although, it's not too complex and all, it definitely delivers! Loved it! I have already tasted this whisky as i had a bottle from two years ago, when it was released. However, thinking that the Valinch series (without even mentioning the 2011 release) would be sold out by now, i found a 2011 release in a shop during my stay in Switzerland. I bought it for 43,90 euros, which i find excellent value for what is a very good "what-i-thought-was-discontinued" whisky. Anyways this the second parter of my 2 weeks of christmas, which is a series i wanted to keep going but due to the hectic nature of the holidays, couldn't be done. Let's revisit this modern classic.. Nose: A big unconventional limoncello/lemon rind meets the nose alongside it an "almost as big" bourbon-oak vanilla. The vanilla note is very complex but although it has vanilla cream as well as confectionary vanilla it is the vanilla pods that jump up at you. This hints to the high quality first-fill bourbon casks used, no doubt. Some barley-citrus notes with a delightful sweetness, a natural sweetness followed by some bitter wood-spices from the high-quality oak. Some mild spices and a more distinct camomile note, more "pure" herbal than "tea-ish". Palate: High quality limoncello comes forward with the lemon rind in tandem as on the nose but this time with icing sugar, confectionary lemons (lemon drops) and lemon madeleine's (french fluffy vanilla-lemon cakes). Some baking spices: Cardamom and a slight cinnamon note, that camomile note appears again. The oak and vanilla take over for a while with vanilla cream first but leaving the scene for that florally vanilla pod note. Wood bitters and wood spices linger before some of that lemon rind comes back. Finish: The limoncello note, lemon rind and bourbon-vanilla make up the finish as well as the overall character of this malt. It isn't the most complex whisky, but that is because it's complexity is not by design, it is by default. Meaning that it's big, "lemon-vanilla" rush, natural, cask strength firepower gives it enough natural complexity to give it a big mark in anyones book. Great review, @Lifewaterforce. Lots of variations of lemon and lots of intensity in the Valinch 2011. This one is a great one to try for those who have never yet found an Auchentoshan which they liked. I have a bottle of the 2011 Valinch too, and very much like it as well. I've heard, though, that the 2012 release was not as good as is this 2011 Valinch. Have you tried that one? Yes i sampled from a friend, and indeed the word of mouth is true, it's decent but lacks the depth. A tasty little so&so it remains however, would recommend the 2012 still, considering that, like this one it's of very good quality. You can be assured however that you still have the best version! Let's not forget the $67 cdn this cost. Still clinging to 1/2 bottle that I actually forgot about for the last year or so. Re-visited and still found it to be an incredible value considering what we pay in Ontario for SM's. Maybe the sweetness is a little cloying but a solid after dinner dram if ever there was one. @Astroke, cheers! 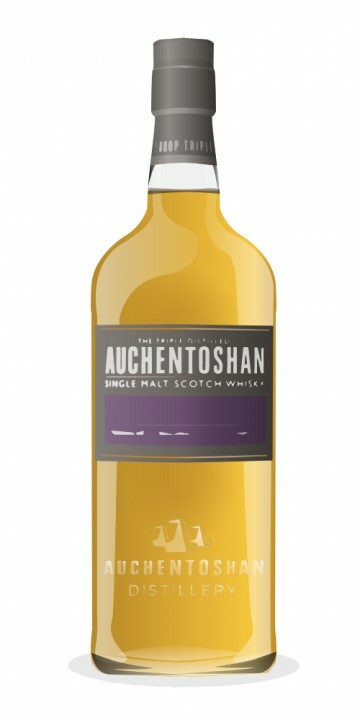 I expect to sit down with some of the 2012 release of the Auchentoshan Valinch soon, and do a review of it. Several months ago, I posted a review of Auchentoshan Classic and declared it the worst whisky in my cabinet. Yet the Valinch is essentially a cask-strength version of the Classic and it’s bursting with rich, sophisticated flavors. This is an example of how ampimg up the ABV can help ac-cent-tchu-ate the positive and eliminate the negative. What was harsh and chemical-y in the Classic evolves into fruits and roses in the Valinch. But no high ABV can disguise youth completely, and the Valinch retains some of the too-fresh-wood bitterness that rendered the Classic so unpalatable. These bitter notes are better integrated into the flavor profile, however, serving to keep a lemony tartness from overwhelming everything. Still a bit too much dusty wood and immaturity for my liking nonetheless. Notes based on a seven-month old bottle at below the halfway mark. Nose: Full-strength and right out of the bottle, this is nasty, funky stuff. Reminds me of the summer when I worked down the hall from a boy’s locker room in a school that had been closed for three years. It’s cask strength. Don’t be afraid of a little water. A few drops, a few minutes, and the nose has turned into Mother’s Day, full of candy and flowers. Lemonhead candies and roses, to be specific. Also some bitter red apple peelings, a little pepper, and loads of cream with a slight vanilla nip. Palate: Arrival is all lemon, both tart fruit and sweet candy. Too stinging at first, but the sweetness soon turns rich, buttery, and even a bit peppery. Think birthday cake with butterscotch frosting, a healthy scoop of vanilla ice cream on the side, and all dotted with those little red hot candies. There’s just the right touch of oiliness in the texture for a smooth, silky mouthcoat; this, combined with the layered sweetness, make for a wholly unique palate experience. Light flavors in a dense composite. You’ll never want to swallow. Finish: Not bad, but a letdown after such promise. Decent length; with some nice vanilla, citrus, and pepper. The youth of the Valinch can’t hide at this point. Wood, dust, and chemicals compete for attention with the good stuff. Most sources estimate the Valinch’s age to be in the six-to-eight-year range, which sounds about right. Good whisky, to be sure, but I can’t help but wonder what wonders would be produced by doubling the cask time. My first ever whisky review shall be of my first ever Auchentoshan and the second single malt whisky I ever bought - The 2011 Auchentoshan Valinch. Initially I was put off by the cask strength nose and delivery. However upon further education, I began to allow this malt 20-30 minutes to open up and also added around 2 teaspoons of water which just about suits my palate perfectly. This is a review of a Valinch which has been sitting 3/4 full in my cabinet for around 3 months now. The reviewed drop has been left to open up for 20 minutes and has had two teaspoons of water added to approximately 1.5 standard shots of Valinch. juicy, fruity barley with peach bursts that transform into a subdued creme brulee flavour. Surprisingly dry and short. More creme brulee and / or egg nog with a sprinkle of cinnamon and spice. A nice whisky that for myself, wasn't easy to like. But once liked, it is now quite easy to drink and yes...I could even say an enjoyable experience. @fastpoose: thanks also, I also felt exactly the same way, however Im not sure if I will buy another bottle or not...not because I do not enjoy the whisky but simply because there is so many other whiskies I still want to try. I bought the Valinch for around $90 so for that price there is many great whiskies I can buy that I have not yet tired...such as An Cnoc or Glen Farclas 12. I too believe that oxidation, or 'time' spent opened in the bottle assists this whisky in smoothing out and opening up to become a real flavoursome individual. This whisky also makes me want to do a side by side tasting with the Auchentoshan 10 year old (or classic) as I believe the valinch is a cask strength version of the 10 yr old. Nice review, I picked up this some months ago. I had my eye on it for a while, then Ralfy gave it big wraps, so I got one. I was a little disappointed with this early on, it was quite volatile, with quite young spirit nuances, and had masses of vanilla, I quite like vanilla but this was overboard in my opinion. I am now having another glass right now, probably 4 months since opening and half way through the bottle, and it has settled beautifully, I am now getting much more toffee, brulee and floral elements. Funny I wouldn't have bought another bottle, but now I think I will, prety good value also. Nose: hot, creamy, zesty, sharp, slightly dusty and some vanilla. With water ahhhh, that’s better. Almost lime panna cotta, grassy notes underneath, with floral rose notes lemon to, beautifully refreshing. Pallet: fairly full bodied for a light style whisky. Sweet, intensely sharp, very raw. With water, gentle at first as it washes it over the pallet then light cream, little bit of fizz, sherbet maybe? Very mellow honey (not too sweet) vanilla, more grass and a touch of banana. Beautifully clean and restorative whisky. Would probably contrast very well with big earthy cigars like punch or partagas. An excellent dram, highly recomended even more so given the price. @Volks, your estimation of the age is a bit off. This is whisky between 5 and 9 years old, not 10. In this case, that is actually a compliment to the whisky. One of my fav daily drams and good value for money. Nose: Powerful, needs water to tone down the alcohol, but you will be rewarded with sweet vanilla citrus, with very creamy undertones. Palate: Very strong citrus, spiciness appears, the vanilla cream and toffee stays nicely in the background. Finish: Really nice and sweet, superb stuff! If it's there on the shelf, you should buy it! @Jericho: agreed! The 2011 edition, by the way, is just a tad better than the new 2012 edition, so if you can still get a bottle from 2011, do not hesitate. Quite excited about this one, my first Auchentoshan and my very first Lowland whisky ever. Nose: Has got quite a sharp punch on the nose due to the alcohol content, very sweet, icing sugar and a touch of light honey, some citrus rind oils, a good sweet maltiness, a bit of dessert spice (nutmeg, cinnamon sugar and cooked vinilla), after a bit of air I get a nice touch of banana as well. Palate: nice oily feel in the mouth and quite an alcohol punch on entry, the palate is similar to the nose. Leads off with icing sugar and marsipan, like I've just ran my finger across a well made cake ( not that I do that of course :D ), yummy maltiness, a good dollop of honey, citrus peels, maybe some salted butter and charred oak, smooth cooked vinilla, nutmeg and cinnamon sugar. Finish: Trails off with vinilla sweetness, maltiness, maybe a little honey and disert spice. Delicious stuff, defiantly appeals to my sweet tooth. Lets see how it reacts to a bit of water. Nose: pretty much all the same notes but it pulls the alcohol punch right back, making it very smooth and a it a little creamier, a bit like vinilla custard. I Love vinilla custard. Palate&Finish: no real change to the palate, makes it dangerously easy to drink though (personally prefer it with the punch it has neat, plus it makes it hard to pace myself when its this smooth), makes the finish a little more mellow, possibly brings out a little toastiness in the tail-end as well. Well this is great stuff, does anyone know any other bottles in the Auchentoshan range that I should check out that are reasonably priced? Anyone who likes there whiskys, light, sugary and sweet should love this stuff. I saw this whisky as a bit of a random purchase really, I like the standard Auchentoshan malts and thought I should take a punt on the Valinch due to its name really! It’s a very light yellowy-brown colour in the glass, and sits at a rather hefty 57.5% in strength! That strength and power didn’t come through too much for me in the nose, as I got the softer aromas of peaches and Olive Oil! There was an edge to it, but I found it hard to describe in all honesty. When sampling this I found two fairly different tastes, the first being like a Worthers Original sweet, the toffee and sweetness of that. Then though I found a hint of batter, like the batter you would use to make a Yorkshire pudding. I thought it was a strange taste to be honest, but I guess that’s the beauty of whisky eh! The strength did come through in the taste, knocking me back a bit! It was a tingling sensation of a finish, and one that wasn’t unpleasant at all. I thought it was a very good expression, a wee bit rough around the edges but enjoyable all the same! Thanks for sharing your thoughts, Alan. I was looking forward to your notes. I love the title you gave the review! Thanks Mark, glad you like it! Nose: crème Brule with lemon rind on top. Coconut. And a lot of vanilla. Youthful, and very strong on the nose, it takes a but of water with grace, and some time in the glass. I also suggest to let it sit in the glass so you can nose it better, especially if you are new to whisky. Palate: Banana loti (you know the stuff you eat in Thailand) Powerful ginger spice lemon combo. Wood and sherry. Chewable and intense. That’s why I love cask strength. This is great. After some time in the glass. Mango !! Finish: medium. Cocoa powder. Wood. Nuts. In two words : I LIKE! , this is very good, a young, full of flavours, fruit and exotica.A cracker of a dram, which at a good price. I need me some of this. Whisky distilleries, i do hope you will learn that we are looking for cask strength expressions. 40% doesn’t do it to whisky anoraks these days, right? I do hope many distilleries will follow and release cask strength, even at a young age, so we can experience the true flavour of undiluted goodness. I see you have started tasting the samples I've sent you. Good man. I'm glad the Valinch is so much to your liking. It's become one of my go-to-before-dinner drams. The name 'Valinch' is easily explained, as it's the name of the copper pipette used to draw the whisky straight from the cask. The Valinch has no age statement, which means it's rather young. It is in fact the cask strength version of the popular Classic. I got to taste this just after it's release during my visit to the distillery in 2011. It's a limited release. The nose burst with sweet vanilla, as we are used to from young Auchentoshan. And there is a sweet touch of citrus as well. Crème brûlée and some fresh barley. The attack is quite peppery to be followed immediately with wonderfully soft and creamy liquid that warms the mouth. This makes me happy. It's the perfect summer dram. Perfectly drinkable without water, despite the high ABV, but with a few drops of water it doesn't lose any of it's punch and remains fully flavoured. The finish is crisply like a vanilla biscuit and last quite a while. This is much better than the Classic, which I found to be somewhat simple. A worthy big brother, if you ask me. This is also the first whisky created by Jeremy Stephens, the new Senior Blender of the Morrison-Bowmore group. They have put the right man in the right place. The Valinch has landed in my cabinet!! My wonderful wife surprised me with the bottle yesterday as an early anniversary gift (it was at the top of the 'to buy at the LCBO' list). The only caveat being that I have to wait until our actual anniversary at the end of May to open it. Not a problem, as I still have 1/5 of my 'Toshan 12 bottle to go through in the meantime (it has really rounded out nicely in the past 3-4 months...it has now been open for 12 months). The Valinch seems to be going rather quickly here in Ontario (over 60% of the original allocation seems to have been sold in less than a month). The Valinch is coming to Ontario (I believe at the end of March)! At $64 it's basically in the middle in pricing between the 12 yo ($54) and the Three Wood ($77). Any suggestions from those who have tried both on which I should go with first, between the Valinch and TW?